Made of repurposed mail sacks, these graphic pouches are handy for cash, cards and more. 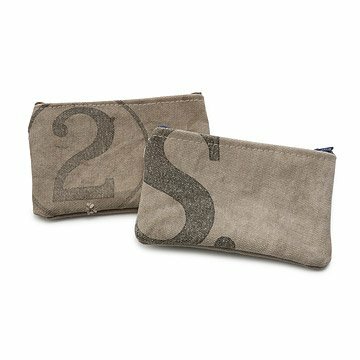 Handmade from repurposed mail sacks, this graphic pouch delivers style to your daily collection of goods. Keep one handy for your cash, cards and keys, or tame your stash of mail, notes and receipts. Carry on! Handmade in Mexico. This was a gift for my sister on her graduation and it's great. It's both practical and cute, and is the perfect size to use in a purse for holding coins, cards, money or other small items. We got this as a gift for our daughter-in-law and she thought it was really cool. She really likes that it's a recycled mailbag as she loves writing and receiving mail. Best small purse I have ever owned - holds coins, bills, credit cards, business cards and more. I am returning it is much too small, I would not have ordered it if I had known it was small. My husband says he is going to use this to organize small things like drill bits in his work backpack. It arrived promptly, however it is a bit small. Bought this little coin purse for my niece who's dad is a mailman. Unfortunately it just looks like a plain old coin pouch. No printing or character to it, so the gift didn't mean as much. It was more like up cycled blank canvas. Definitely not worth the price. As a retired (25+years) postal clerk, I emptied and filled many of these dirty old bags. I now meet once a month with 4 other retired clerks who also had the honor of using these bags. What a perfect gift for my friends. I am sure will will have lots and laughs and memories when they open their gifts. Its super cute and fits in my small bag. Its great!